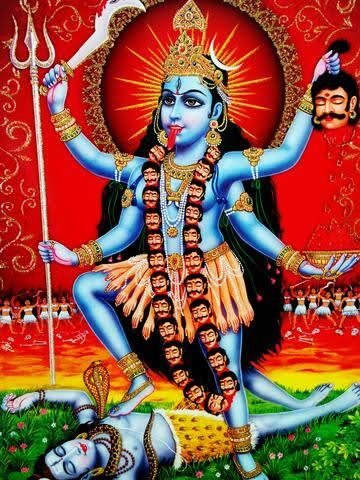 The dhyana-mantra of Dakshina-Kali quoted in Tantra-saara says that She is holding Kharga in Her upper left hand, chinna-munda in lower left hand, abhaya-mudra in upper right hand and vara mudra in lower right hand. (Reference:Sastramulak Bharatiya Saktisadhana, Upendrakumar Das, RMIC ,Vol.1, chapter 11, page 468-470). In Bengal, we do see Her images almost always tallies with this description. But in other parts of India, especially Bihar and Uttar Pradesh, we find a different image.I have enclosed such an image. Ravi Varma also did paint an image with such features. There must be some dhyana-mantra corresponding to this particular form. In which scripture do we find that dhyana-mantra? Browse other questions tagged puranas identification-request tantra kali . What body part of goddess Sati fell on Dakshineswar Kali temple and Kalighat Kali temple? Why does the Sudarshana Chakra resemble a tantric yantra in this image?